The Psychotrauma & Crisis Response Unit offers a brief training course to outside organizations, groups, corporations and businesses on psychological first aid. Our unit has been asked to run one-time courses for IDF sanctions, groups in the police force and even for a local squad of fireman. For more details e-mail Avi at avit@1221.org.il. “Kindness starts at home,” states the aged-old saying. For the Trauma and Crisis Response Unit, this is a core value. 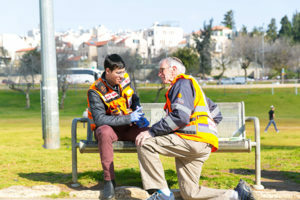 United Hatzalah is comprised of 3,200 medics and that number is constantly rising. Quite often, our very own medics experience emotionally taxing calls and walk away from a scene with emotions and feelings that they do not know how to process. Our unit assists our medics in dealing with what they witnessed or were involved in either with 1:1 “sessions” or in group settings. On the same note, in some situations, our very own psychotrauma unit volunteers come away from a situation with certain levels of trauma from what they witnesses and experienced. With this in mind, we frequently conduct debriefings and “check in” to ensure that we are taking care of our own volunteers. 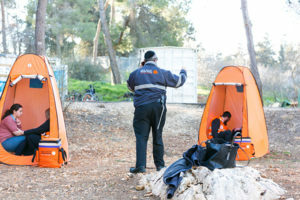 Throughout the country, different chapters of United Hatzalah medics often request a debrief for their unit after a large incident and we are then able to send psychotrauma unit responders to conduct the critical incident. The Psychotrauma & Crisis Response Unit has started a K9 Unit which, as of today, includes one very special puppy named Lucy. 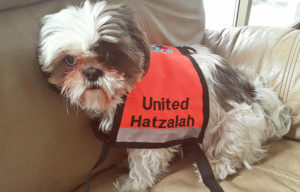 Lucy, the orange-vest-wearing psychotrauma dog, has assisted people in crises on numerous occasions by helping bystanders and family members move away from the traumatic scene by “following” the dog. When there is a medical crisis, the first step that needs to take place is the removal of the individuals from the scene. The dog plays an important role in helping our responders remove individuals from the situation. Once the person or people are removed, they many times become distracted by and calmed down simply by focusing on the dog thereby immediately lessening the immediate stress. Our very own Psychotrauma ambulance is here! This ambulance’s expenses were entirely raised by wonderfully dedicated donors who believe in this cause. It is a specialized ambulance with a divider down the middle thereby splitting the area between psychological and regular functioning medic sanctions. In addition, there is a tent that rolls open from the side of the ambulance that creates a shelter command center for trauma victims to be relocated and placed in a safe and “out of the action” space. 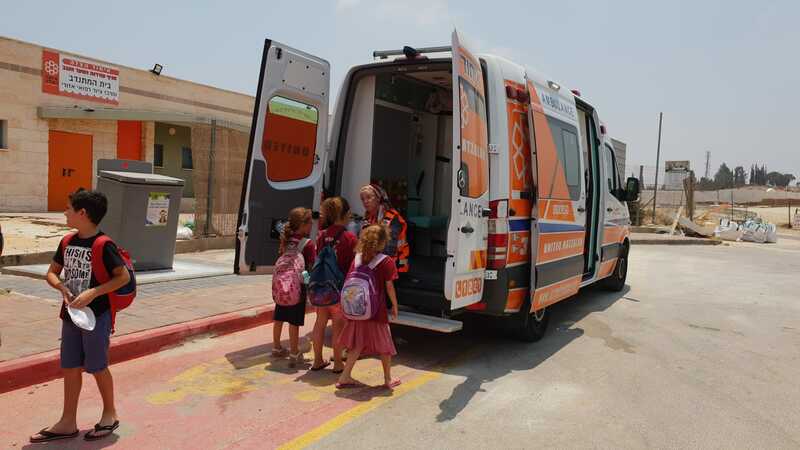 It functions as a normal ambulance and can be used for any physical medical emergency and is equipped with all medical, as well as mental health equipment. When there is a mass casualty incident in which many volunteers are needed at once, the responders will be called to meet in one central location where the ambulance will transport all the responders together.